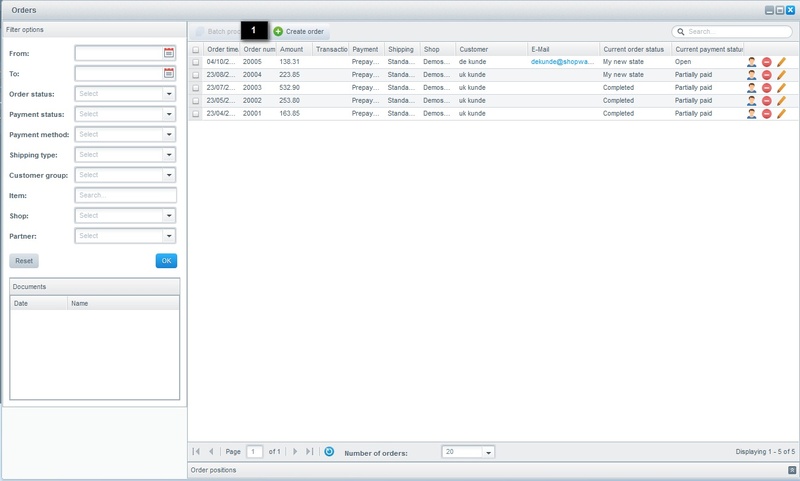 The backend orders plugin is ideal for creating orders from the backend. 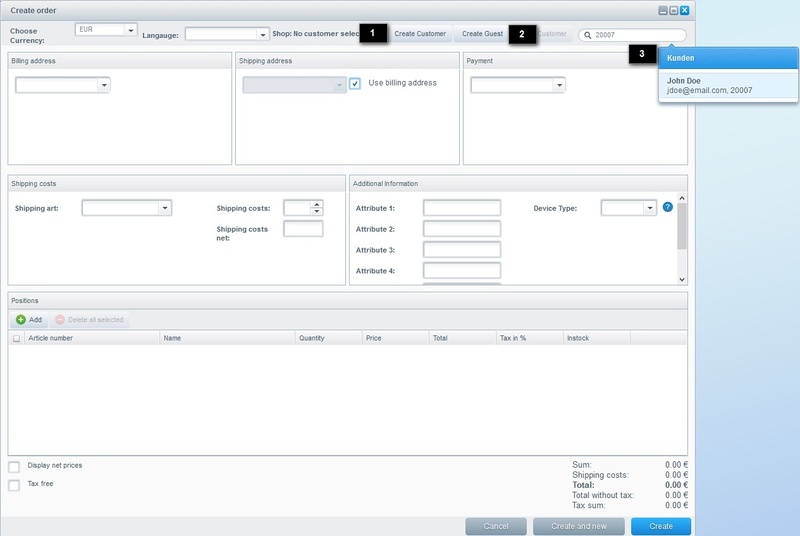 In case of your customers call, fax or email you and want to buy something, you can easily place the order via backend. The module is also able to classify the incoming orders by type in the anlysis module. You can get the plugin Backend Orders in our Store. This email is used for guest accounts (1), which are created when your customers don't have an account in your shop and want to order by phone for example. 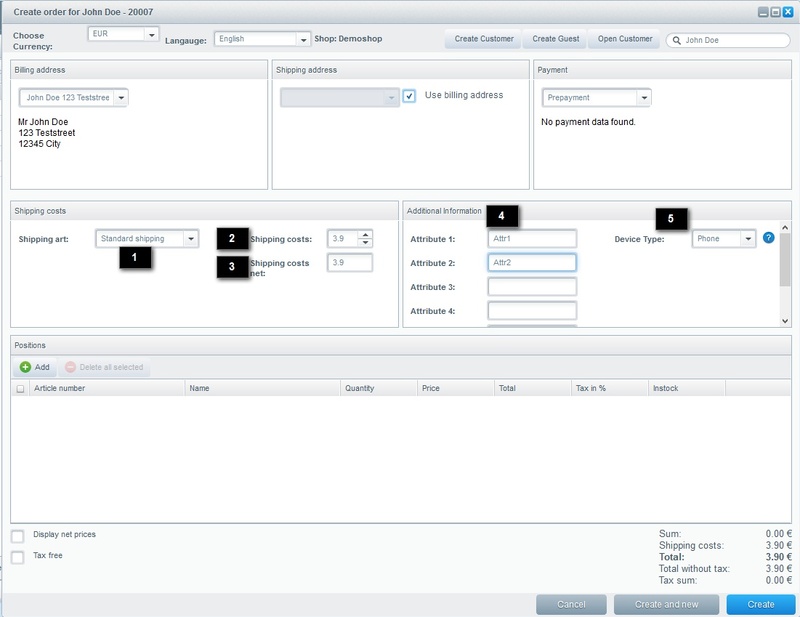 With the desktop types (2) you can set the channels on which the orders come in, for example, phone, fax or email. Different entries have to be seperated by a comma (,). 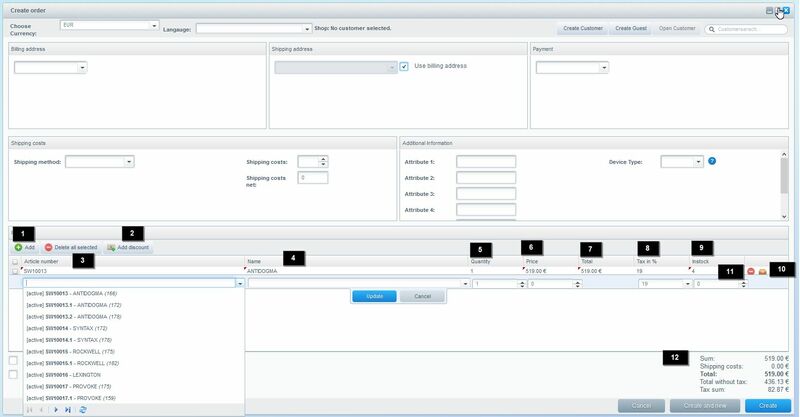 After installing the plugin you get the additional button create order (1) in the order overview to place orders via backend. At first create a user account (1) or a guest account (2) or simply search for an existing customer (3). Via the dropdown in billing address (1) you can choose an existing billing address for your order. If the shipping address is the same as the billing address, press the checkbox. If not, you can choose an existing shipping address(2) in the dropdown. This dropdown chooses the payment method (3) of this order, just choose an existing payment method here. Choose the shipping method (1) you want to ship with, the shipping costs will be entered automatically. If you want to override the default shipping costs, you can do this in shipping costs (2) and shipping costs net (3). In the free text fields (4) you can set the free text fields if you work with them. Additionally you can set the device type (5), this is the channel, over which the order has been placed (phone, fax, etc.). By clicking Add (1) you can add the desired positions to your order. By clicking Add discount (2) you can add an individual discount to this order. You can aonly add one discount per order. In Article number (2) you can search for the items you want to edit. Here you can search for the ordernumber and the item name itself. After adding this field is filled with the ordernumber. The Name (3) field can be used for searching items by name. Here you can also use ordernumber or the name. After adding, the item name will be place here. Type the desired quantity (4) of your item here. The Price (5) is filled by the module, but can be overwritten for this order by clicking in the field. Total (6) shows the sum of this position. Tax in % (7) shows you the tax rate which is used for this item, if you want to, you can change it here. Instock (8) shows you the amount of items in stock. Each position has action buttons (9). By clicking delete position you delete this position for this order. For own safety, you have to confirm that. Clicking open item the items detail page will open. The Cart value (10) shows the amount of your order live. After any action, it will recalculates itself. Name: (4) The name of the discount, which will be displayed in the order confirmation or the order documents. The discount (1) is displayed like an article, but can not be altered afterwards. 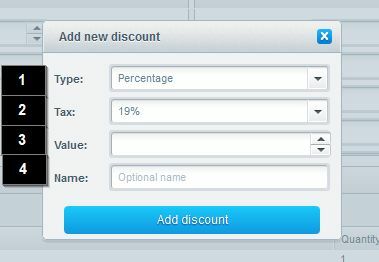 To change aspects of a discount you have to delete the old one and create a new one right away. 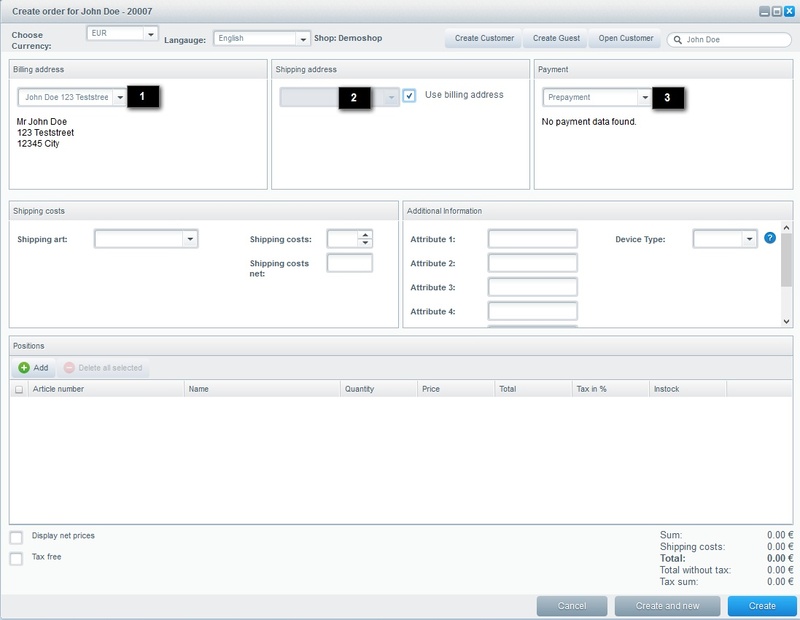 Create and new (1): issues the order and directly opens the backend order window again. This is most sensible if you plan on making up several orders in a row. Create (2): issues the order, closes the current window and opens the order's details page. Our comfortable analysis gives you a nice overview of the amount of orders which have been places by the different devices. With Shop (1) you can choose a shop for your analysis. This sets the date, which you can filter by. Just choose From (2) and To (3) to filter the result. By clicking Update (4) the result will be udpated. This will export (5) your filtered result as a CSV file. This is a view switch to switch between chart / table (6).